Limited edition gift set by L’Oreal Professionnel. Cleanse away your worries with this L’Oréal Professionnel Mythic Oil Shampoo.Leaving your hair looking shiny and soft whilst feeling beautiful. Suitable for all hair types. 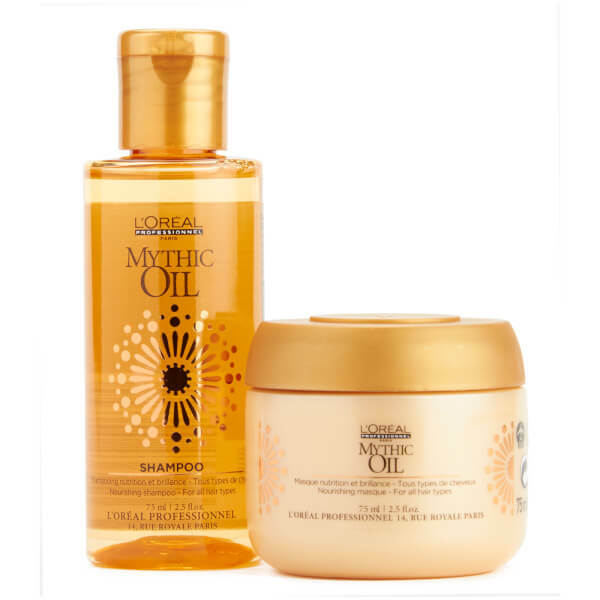 L’Oréal Professionnel Mythic Oil Shampoo uses a special blend of argan and cottonseed oils to provide a refreshing and cleansing experience.Deeply nourishing for superb results after every wash. Wet hair apply shampoo, rinse and repeat follow with mythic oil conditioner or masque. This ultra-nourishing hair mask treatment is enriched with argan oil and myrrh extract that will leave hair feeling nourished, disciplined and looking illuminated with a shiny finish. It’s ideal for those with thick hair and for a little extra luxury treat. After shampooing apply to hair from root to tip leave on hair for a minium of 5 minutes. For a deeper treatment apply from root-to-tip at night and wash out in the morning. 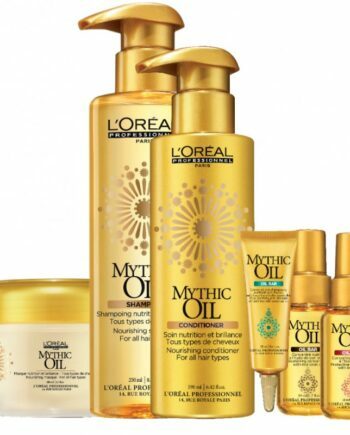 Buy Serie Expert Mythic Oil Mini Gift Set on-line today at Riah Hair.